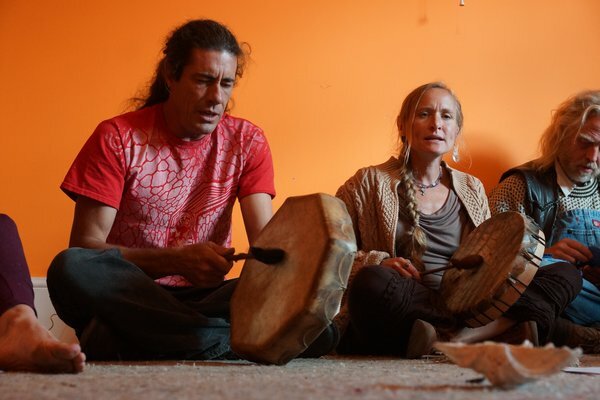 Songs are one of the main tools we use to call upon the Spirits in Traditional Ceremonies. Attuned to the melodies and sounds we send with our voices, THEY come to help us. Hearing our pleas for help by way of song, we must not underestimate the power that each of us carries when we learn specific ceremonial songs. There are different schools of thought in terms of the types of songs to be sung in various ceremonies. In keeping with the lineage that The Singing Stone carries for certain ceremonies, we prefer songs that are in an Indigenous language and were brought to the people in a spiritual way. Native American Church artwork by Fred Cleveland. Moving forward during a time when Native languages are becoming used less and less and the people of the world are of more mixed ancestry, we try to maintain a continuation of the old ways. While some details of songs and ceremonies may have been lost or are incongruent with the present time, we feel it is an obligation to keep what we can the way it has been for many, many years. As our ancient Ancestors did so long ago, there is still a magic that comes through now when we are open to the mysterious revealing itself through us. We are an evolution, a prayer manifesting and so it does not serve to refrain from listening to Spirit while allowing the creativity to spring forth. Songs and other messages may be gifted to any of us if we are open to the possibilities. Buffalo Goddess celebrates the various manifestations that may be shared for all to enjoy and learn from when done with respect for the time and place which expressed. Most sweat lodges are very similar. They have four rounds and the same basic format. Whether the rocks are all brought in at once or not, we first set the stage and then call in the spirits. Some lodges the first round is in preparation for the invocation. In others, it all happens first round right off the bat. Next we address the spirits, pray, ask them something, or just say hello. Then comes the doctoring or the point where the spirits act, where they move about. Typically men would sing at the drum while women sing higher and behind the men joining in on the third verse but sometimes women drum while practicing for ceremonies. Some Women's Drum Groups are emerging as we work towards maintaining a balance on our Mother Earth at this time. We like to say it like this: First, call our friends over, then ask them advice or just talk, then entertain them and they respond, they can give us advice. Just like having guests over, we'll probably have to feed them and even get them back home. So it is in the world of invoking spirits, not much different than inviting embodied guests over. The songs follow a logical sequence. This is the same with any ritual anywhere! This is important for us to explain so that people understand why Tradition is so vital to the overall effectiveness of the ceremonial experience. Practicing for ceremonies in Glastonbury, England. Learning songs is is not only therapeutic, it can give you the key to the doorway of another dimension. Song has always been the invocation key in every culture of human kind. One need not take our word for it though, find out for yourselves! To enjoy songs NOW visit our free LISTEN page. Heard them all? Become a member! Visit our MEMBERSHIPS PAGE to gain access to special songs, discounts and special event invites.